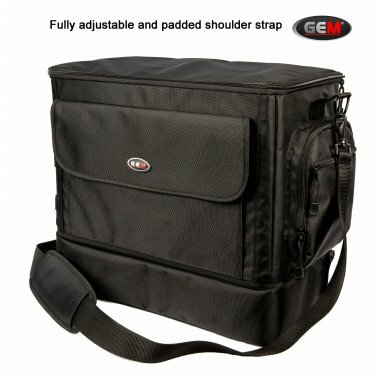 At last a bag that is really designed for the professional car detailer, being able to carry up to 18 different shaped 500ml bottles with spray heads, or fewer bottles up to 5 litres in size, as well cleaning clothes that can be separated (clean from dirty) in the removable divided base. The base can alternatively be used as a pre-show compact prep bag. With fewer bottles in the case the bag can easily accommodate a machine polisher and pads. The attention to detail in the design is amazing. Features such as the customisable pods for each bottle, so they can be picked up and dropped into the bag with no fuss (no fiddly elastics). Reinforced walls to keep the case rigid when fully loaded. 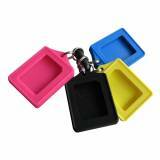 Magnets to keep the lid securely open when using the bag around the car. A carry handle for use when moving the bag around the car you are working on, and a padded shoulder strap for when on the move. Non-slip feet to keep the bag secure when in the car and off the damp floor when in use, and many more features. The bag allows you to organise all of your equipment so it is easily and quickly assessable with the various accessory pockets around the case. Brushes can be stored in the elastic loops on the side of the case, clay bars and waxes can go in the side pocket, and additional cloths and accessories can go in the front pocket or internal netted pocket. The back zipped pocket is ideal for any documentation that you need to carry. With all of these amazing features, in addition to the bag making it easier to transport your gear around, we are sure it will also aid you in being more productive when working on cars. All of the equipment you need is by your side, organised, quickly accessible, and can easily be moved around the car as you work around it. Order with confidence with the GEM no quibble return policy in addition to the %u2018GEM Life Time Warranty%u2019 against manufacturing defects, reflecting our confidence in the design of the bag and the hardwearing materials used. In addition to the benefits and features listed at the top of the page, we would just like to highlight further some of the great design aspects of this bag. The individual pods for your different shaped bottles can be adjusted to the size of each bottle due to the unique rows of flexible dividers. There are 17 dividers in total so you can fully customise the bag. If you have larger items such as a machine polisher, simply remove some of the dividers. The removable base to the case also has two movable dividers, ideal for separating clean from dirty cloths. We have made the base removable for two reasons. By removing the base you now have a more compact detailing bag, ideal if you have a shallower boot, but not stopping you from carrying additional items needed. As soon as you reach your destination simply add the base back on again. 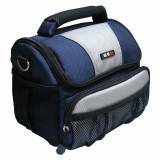 Secondly, it can also be used as a pre-show compact prep bag. When the base is removed there is a protective base to add to the bag, which also has non-slip feet, and protects the zips on the base of the case from getting damaged. Right down to the finest points, the thought that has gone into every aspect of this bag is quite amazing. To secure the lid when it is open and you are moving the bag around, there are magnets to keep it securely open. Hard zip pullers have been replaced with ergonomic soft zip pullers just in case they were to come into contact with your car. For this reason also, instead of plastic clips on the front of the case, the front pocket is secured with magnets. To keep the case rigid when fully loaded, each of the walls, base and top of the case, in addition to the dividers in the removable base are reinforced so the bag does not deform when fully loaded. You can order with confidence knowing this bag is backed by a no quibbles return policy in addition to a ‘Limited Life Time Warranty’ against manufacturing defects, reflecting our confidence in the design of the bag and the hardwearing materials used. Please note only the bag, shoulder strap and carry handle are included. None of the additional products inside the bag are included and are shown for illustration only of how the bag can be used. Tina lambert May 12 Mega fast delivery and well packaged. The bag itself is just what I was looking for, something not to big that I could wear cross my body. My camera fits perfectly and is well protected. Also lots of little pockets for other bits. 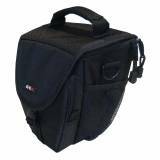 I would recommend this anyone who didn\'t want a big bulky camera bag. At last a bag that is really designed for the professional car detailer. Carry up to 18 500ml bottles.